I've made my first pillow. The wording says Xmas 2011 and i used my sewing machine to put the words on. I need to put the cording around it but it was really easy to do. I followed Lynn's instructions on how to make a pillow and as soon as I visit spotlight for some fabric glue I will be adding the cording to this lovely pillow. It really didn't take long at all to make. The only problem I seem to have when stuffing things is not putting enough stuffing in and realising after the fact! I have also finished the 8th penguin. They're pumping out at the moment! 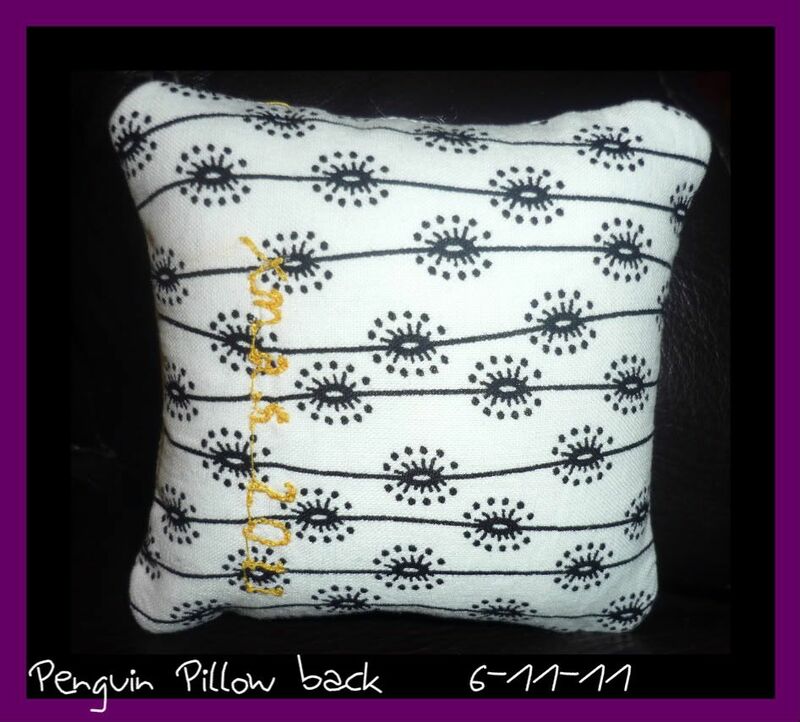 Congrats for the finishes, I love these penguins and the pillow looks good too! Your pillow is cute!! Congrats on making your first pillow Margaret!! Wasn't it fun :D!! It was fun :D and it's such an easy way to finish a little cross stitch without framing. So much cheaper! Cute pillow and really cute penguins. I love them!! I wanted to send you an email, but your email isn't attached to your blogger account, so I'm leaving you a comment instead. I wanted to remind you that the Ornie SAL is starting this week and give you the particulars. So here ya go!!! 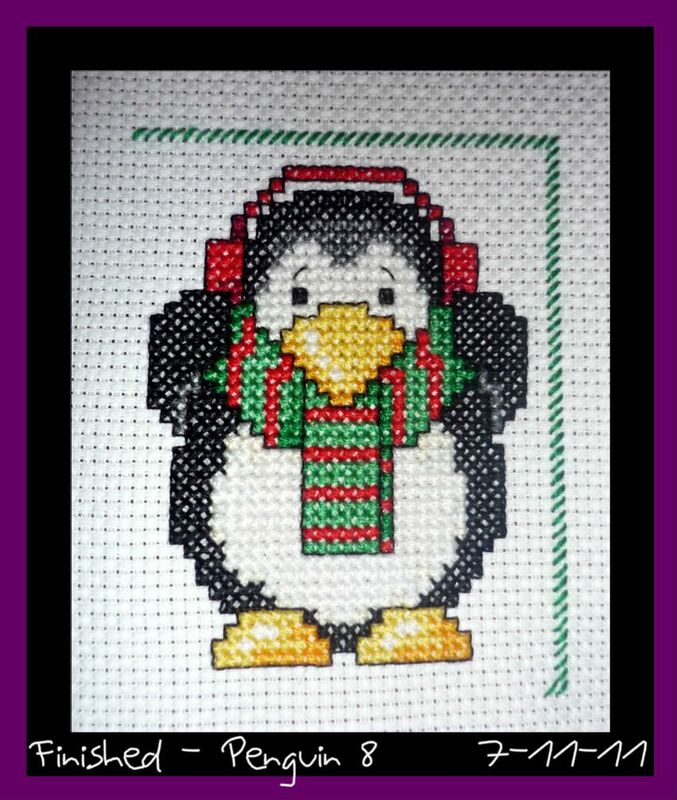 Stitch on Wed on your Christmas project, and post a piccy either Wed night or Thursday morning. If you like, I'll be happy to post pics of your work on my blog as well. If you want me to, just shoot me a pic to jnemitz@cinci.rr.com. Thanks for joining us!! 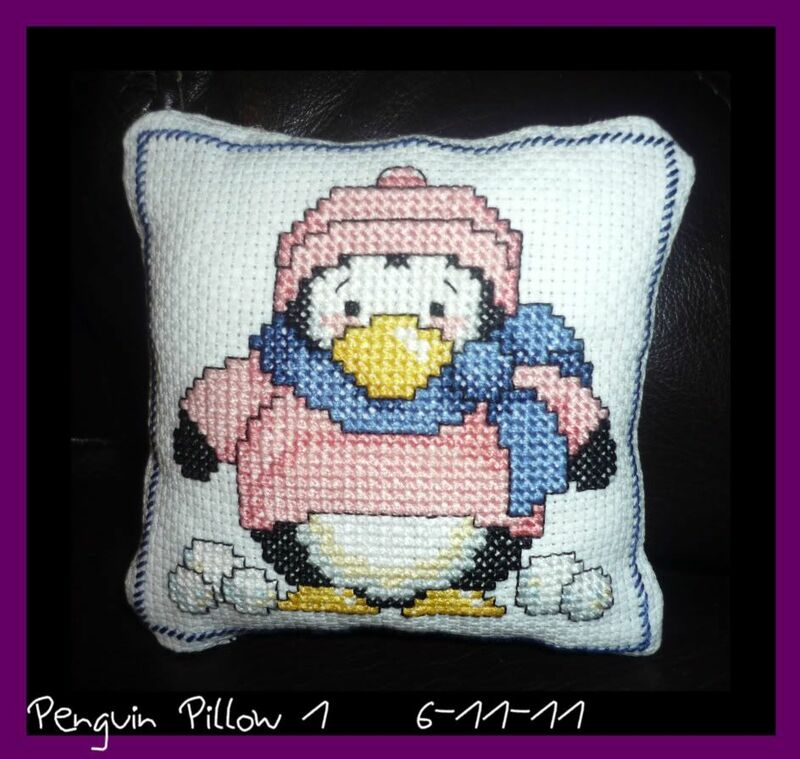 Very cute little penguin pillow. Great job!